The best-selling book about heaven that has changed the world is now a DVD-based conversation kit for churches and small groups. 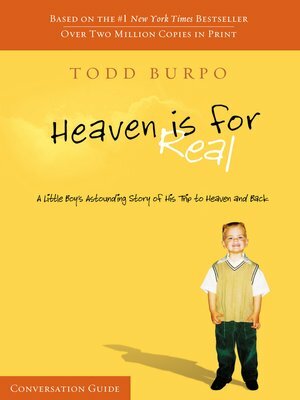 In addition to learning more about what the Bible teaches about heaven, groups will hear first-hand from the Burpo family about Colton's experience in heaven and the way it has changed their lives. Each video session features Todd, Sonja, and Colton, and is filmed interview-style with Natalie Tysdal, the Denver FOX/CW News reporter whose initial interview with the family has gone viral on the internet. The Conversation Guide will take group members through key Bible passages about heaven, helping them understand more about who goes to heaven, when they go there, and what heaven is like.